Whether you’re working your dream job or just working for the weekend, the day can get tough. Maybe your boss is a jerk with impossible demands, or maybe the customers, clients, patients, or students you work with have shared heartbreaking stories. Whatever the case is, sometimes it’s hard not to take work stress home with you and it might seem impossible to leave work at work. Most of us have had the experience of having a bad or challenging day at work and having nothing left in the tank for the people we love at home. And sometimes we take out our frustrations of the day on the people we care about most. Maybe we lash out about dishes in the sink. Or maybe we can’t listen to any more problems because we’re so worn out from the day. Or maybe there’s a lingering feeling of worry about being prepared for the next day, or wondering if you said the right thing when you spoke up during a meeting. There might be a replay of the day going on in your mind that you can’t shut off. 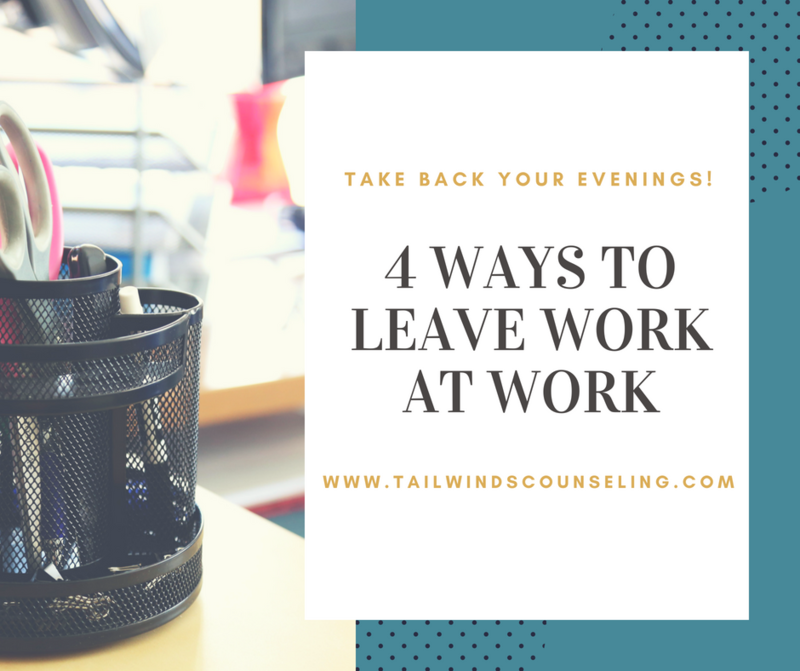 If this sounds familiar, keep reading for 4 practical ways to leave work stress at work and take back your evenings! 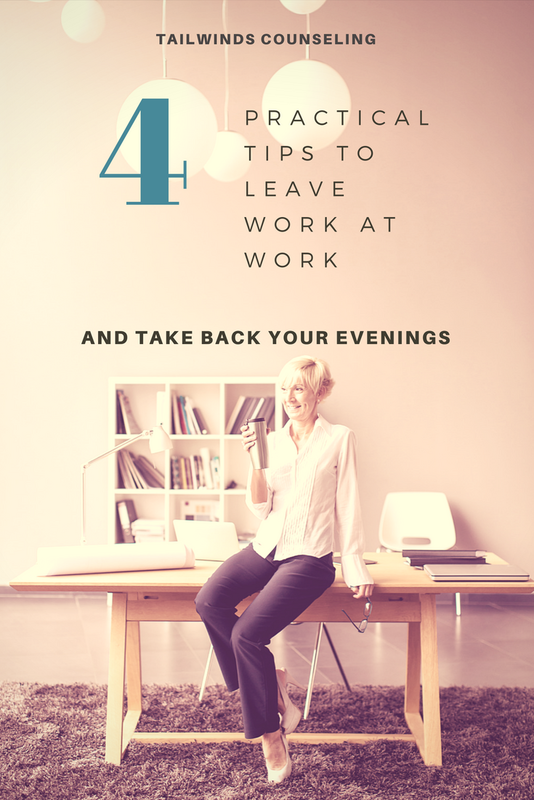 It can be tempting to just bolt out the door, jump into your car and rush home, but one way to help leave work at work is to check in with yourself at the end of the day. How do you do this without taking up too much time? Download my Daily Debrief worksheet or make up your own. A rating for the day. A list of the day’s accomplishments. These don’t have to be major things, like got a promotion today. It’s the little things that push you toward big goals, so don’t forget to acknowledge the small stuff. Write down a couple of things you’re grateful for. It might be something that went well in your work. Maybe it’s a thoughtful coworker that gave you a compliment. It may just be that the cafeteria served up that one meal you don’t hate. Action items for the next day. Don’t list everything that ever needs to get done in your work ever. You’ll get overwhelmed and you’ll feel frustrated when everything doesn’t get done. Two or three priorities is a good place to start. Maybe a particularly difficult situation presented itself at work and you’re not sure how you handled it. Grab a trusted colleague and debrief. Talk about what happened, what worked and what you could do better next time. Sometimes after you’ve messed up it’s hard not to get down on yourself, but mistakes help you grow. Acknowledging what didn’t go well will help you do better work tomorrow, next month, and next year. This one may sound a little goofy but stick with me here. Physically getting the day off of you can do wonders for having an enjoyable evening. So if you’ve got your own office or office mates you like, wiggle a bit. Shake the stress out of your legs, hips, arms, chest, shoulders, neck and head. Ok, be careful with your neck and head – try a roll there. Or pick a three-minute jam you love and have a quick dance party. Or if that feels too goofy for you, you can take a more traditional approach like a jog/run or another workout. I think of this as discharging the tension, stress, worries, and anxiety of the day. The reason I suggest doing it at work rather than when you get home is that it helps to discharge the anxiety into the place that caused it in the first place. That way, it doesn’t get to make its way home with you. If you made it this far, you might be thinking, I thought you said practical tips. I know this isn’t completely possible for everyone, but it is so important. As much as you can, leave your pile of things to do at the office. Don’t take it home. Turn off your work cell. Don’t check your work email. The work will be there for you in the morning. But here’s the thing. It’s up to you to enforce your boundaries. People will always try to squeeze as much out of you as they possibly can. So they’ll send emails late into the night. If you respond, then they’ll know you’re someone with flexible boundaries and they’ll try to push some more. I’m under no illusions that this is possible all the time. Sometimes there’s a big deadline coming up that requires more attention during nonwork hours. But the majority of the time, this should not be the case. And maybe you’ve got a job where you really do need to be attentive to things outside of work hours, like a doctor or some kind of owner, manager, or supervisor of a 24-hour operation. Be sure that you only respond to matters that are truly urgent. If something can wait until the morning, make sure it does. That way, people around you will start to learn and respect your time and boundaries. If this was helpful, share this post with a friend, your partner, or a coworker! Let me know in the comments below how you leave work at work. And don’t forget to download my Daily Debrief worksheet!